Most college career fairs pair students with company recruiters looking to hire students after graduation. But at Rochester Institute of Technology, thousands of co-op placements a year - which may be 12 weeks, or up to eight months - are also offered to students, giving them experiential learning and a foot in the door after graduation. Hannah Kuntz, a second-year biomedical sciences major from Elizabethtown, Pa., attended her first career fair Wednesday in RIT's Gordon Field House, hoping to find a co-op research position with a pharmaceutical company. "My major doesn't require a co-op, but I want the experience," she said. Dressed in a business suit and armed with resumes, Kuntz admitted she was a bit nervous before entering the field house floor and giving her first elevator pitch. She picked out four companies whose recruiters she hoped to meet. Lines were long at some well-known companies, but she didn't have to wait long to meet with Tim Diehl, a recruiter from Bristol-Myers Squibb. They spent several minutes talking, and Kuntz walked away with a smile. "He was from Pennsylvania too, so we kind of connected," she said. Maria Richart, director of RIT's Office of Career Services and Cooperative Education, said co-op employment is "significant, full-time work that prepares students to be skilled professionals while developing real-world competencies to complete a well-rounded education." Most of RIT's undergraduate programs - 98 percent - have a co-op component. Last year, 4,590 RIT students completed co-ops, and some of them completed more than one. All co-ops are 40 hours per week, and only 29 percent were in the Rochester area. RIT students had co-ops in all 50 states and in 30 countries. "Co-op employment helps students understand what they are learning in the classroom," Richart said. "It helps students decide if this is the right career choice or industry for them to work in before they graduate and start their careers. For example, an industrial engineering student may have their first co-op rotation in a manufacturing plant. Upon completion, they may decide that a plant environment is not what they would like to do. Therefore, their next rotation may be in another aspect of industrial engineering. Or they completely love the fast-pace environment and decide that is where they would like to work after graduation." Richart said employers also benefit, as students who are learning cutting-edge technology in the classroom bring those skills with them. "Many of our corporate partners have been hiring co-ops for so long that it has become an essential part of their workforce and possibly cannot do business without having a steady flow of RIT co-ops rotating in and out every six to eight months," she said. Co-op experience was vitally important to Jonathan Ennin, a fourth-year management information systems major from Sunnyvale, Texas, who is graduating in May and looking for a full-time job. He completed two co-ops during his years at RIT - one was with J.P Morgan Chase and Co., in New York City. He said the learning experience he gained in his co-ops was invaluable. "The co-ops on my resume provided me with a lot of opportunities," Ennin said. "It's hard to get into a lot of these big companies, and when they see a name brand you've worked for, it definitely helps." Ennin arrived at the career fair a half hour before it even began, using the career fair app to scout out the locations of 10 employer booths he wanted to visit. First up was Microsoft, which usually hires 50 to 60 full-time students a year from RIT, and hires an additional 60 to 70 for internships, a company representative said. Six recruiters - four of them RIT alumni - met with the dozens of students in line as they collected resumes. Ennin, who is graduating in May, was looking for full-time job offers as a business or technology analyst or in an investment banking role. He's willing to relocate anywhere and hopes he'll have multiple job offers to choose from. A representative from Northwestern Mutual told Ennin they expected to follow up with a phone call interview. "It was awesome to meet you," said Kara Lyon, a campus recruiter. Among the throngs of students in business attire in the field house, Ennin ran into Saunders College of Business Dean Jacqueline Mozrall, who showed Ennin a folder from Integration Point. So Ennin turned around and found their booth and chatted with recruiter Patrick Healy, who called him "very qualified." Ultimately, Ennin stayed for nearly the entire six hours of the fair, racing between recruiters from more than 20 companies. Typically, more than 100 companies stay for interviewing day following the career fair. At last fall's career fair, more than 1,300 students had 1,926 interviews. Offers of full-time and co-op jobs could also be extended days or weeks later. Ennin had four follow-up interviews with companies on Thursday, and two more planned via phone next week. "I think it went pretty well," he said. "A lot of the companies showed interest in me. It was different this time because I'll be graduating and on the market. Plus, I have experience through my co-ops. So we had a lot of things to talk about, and they liked to hear about my experience and my projects. A lot of them seemed to think I'd be a pretty good fit." Kuntz also was happy. "I wasn't as nervous as I thought I'd be, and I made some really good connections," she said. The employers she met with asked her to apply online. The night before the career fair, Ennin and Kuntz met students, faculty and employers in their colleges, who hosted informal networking sessions. "That was good, because it's more of an informal gathering with students and some recruiters," Ennin said. "Meeting for a couple minutes at the career fair is more like speed dating." 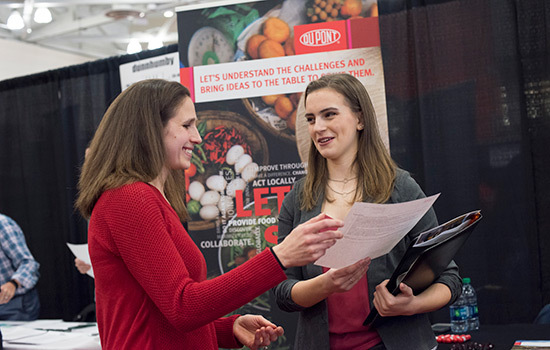 A university-wide career fair is held each spring and fall at RIT; there are several other career fairs held at RIT each year, focusing on accounting, civil engineering, art and design, packaging science, liberal arts, deaf and hard-of-hearing students, and more.